Rating: The self-titled debut LP of Craig Charles playlist (and live) favourites, The Hawkmen, finally arrives and it certainly doesn’t disappoint. The project is the brainchild of Scott ‘The Hawk’ Milsom (erstwhile bassist for Big Boss Man as well as sometime DJ/Production partner of Mako) and displays a similar love for the music of the fifties, sixties and seventies as Reggae Workers Of The World’s RWW II LP from last year. 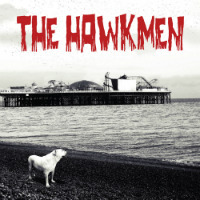 But while both outfits draw from sixties RnB and even fifties doo-wop, they diverge on their other musical cues with RWW (as the name suggests) looking to ska and rocksteady while The Hawkmen head in the direction of northern soul, surf, rockabilly and even country. The material on the album includes both sides of 45s Chemistry Of Love and Soulful Dress along with most recent single Acai while the remaining six tracks consist of previously unreleased live favourites (among them one more cover) completing a set in which dope originals outnumber dope covers by three to one. If you’re familiar with any of the band’s original material, you’ll already know they seamlessly fuse elements of the various genres mentioned earlier and that main lyric writer, The Hawk, has an equally good ear for a timeless hook. All this means that the likes of Love Is Blind and Chemistry Of Love sit easily alongside Hawkmen covers of classics which include the band’s version of the aforementioned Soulful Dress, originally by Sugar Pie DeSanto and re-imagined on this as a scorching surf/rockabilly cut. The flip of that single, also present, is even better – an organ-drenched, grooving soul/ sixties RnB version of Johnny Kidd & The Pirates’ I Can Tell, as is gorgeous closer Love Runs Out – on which singer Scarlet Fagan takes on the mighty Willie Hutch’s northern soul classic Love Runs Out without breaking a sweat. There’s also time for the Duane Eddy-esque instro Cramps, rockabilly-ish cut, The Frathouse, and another favourite of the monkey’s, Baby Tonight, an uptempo early RnB style number which recalls Fats Domino’s proto-ska Be My Guest in its use of off-the-beat piano. All said, the future for hotrod n soul, as The Hawkmen call their sound, seems like it has wings.